While out walking the dogs, I saw a very interesting car wreck in front of the Farmer’s Insurance building in North Phoenix this morning, but have no idea how this could have happened. Hillary was explaining to her driver the 97 reasons why she lost to Trump. Then she pushed the wheel counter-clockwise, averting a serious crash. Thereby preventing the driver from getting a medal of honor. We call it the stolen valor incident… No really, that’s what we call it. and while on gravel even anti lock won’t work as expected. Driver overcompensates steering to the right(or need to steer once again to the right due to people on the sidewalk. )During Emergency break even anti-lock won’t work as desired when on gravel,hits the cube-thing. 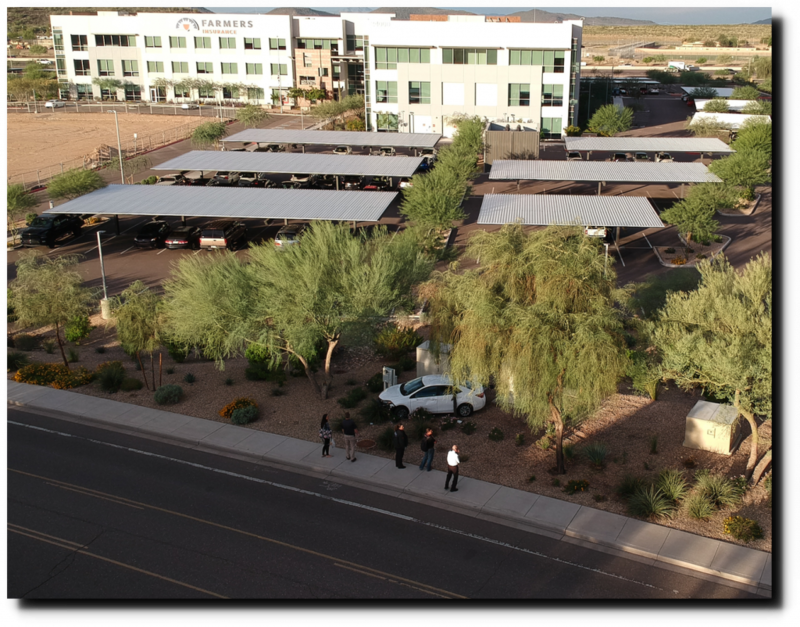 What, no solar panels on those parking covers? Shame on Farmers…. They’re working on a new idea for a commercial. Texting while driving. I recently read that it is now worse than impaired driving for percent of accidents. RAH could likely address this issue better than any of us. There’s no explaining the crazy drivers here in Phoenix. They’ve come from all over the country and drive like it’s the Grand Prix because there’s little more than sunshine to ruin racing conditions. 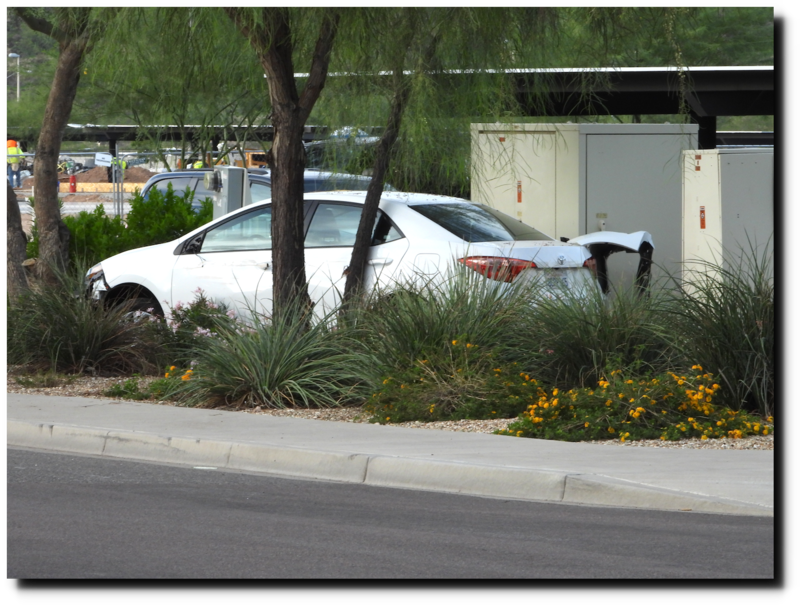 Only a trained “keen” eye can explain this one…The car was not traveling on the road shown in the photo, instead the car was parked in the lots on the other side of the vegetation. The driver back-parked but when she re-entered the car she forgot, putting the transmission into “Reverse” out of habit. To make matters worse, when the car didn’t budge because the rear wheels were against the curb, she floored it, shooting the car across the vegetation. What do I win? The car got to it’s resting position by moving forward …. look at the front of the car and the tracks in the gravel. Trained eye ….. The marks in the gravel suggest the car spun out somehow and rotated into the metal box and stopped. Here in Canada, on the day after marijuana was legalized I passed a car on the highway where the driver was smoking dope while texting. I swear he had no hand on the steering wheel, which explained why he was drifting into my lane. The Toyota hit the curb coming from the right side, went airborne over the plants and stopped when it hit the gravel. The tire mark on the curb could be from this incident. 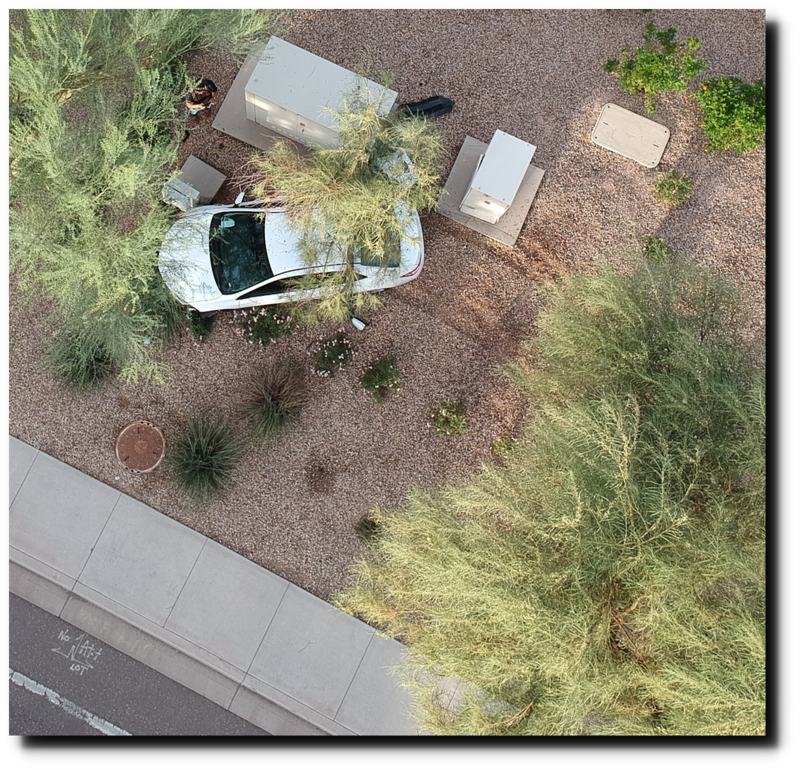 In alternative, the U.S. Air Force is practicing the drop of vehicles into Phoenix neighborhoods. It’s those utility boxes. I see it all the time. Vehicles are attracted to them like they’re super magnets. That’s right. Do you thing the Air Force knows it and uses them to home in the drops? That’s right. Do you think the Air Force knows it and uses them to home in the drops? I don’t know, but in truck stops I’ve seen where trucks have tried to crash through 8″ pipe concrete filled dead man guards to get at a utility box or fire hydrant or light pole. The sat-nav was proving to be worse than useless. And now they were seriously feeling the heat. There are some real geniuses out there. Gaia’s holy herb flooding in from California and Colorado? I love how nicotine is evil in the green religion but THC is worshipped. Ha! The reply above was supposed to be in reply to (and under) CW’s “fine line” PTL trucking post. Well, nobody’s human! Isn’t it obvious what happened? It was global warming! Pretty sure the car and its tracks were always there. The trees and electrical boxes grew up around it over the decades. The driver, who donated money to Stormy Daniels’ GoFundMe, just heard on the radio that Trump’s lawyers submitted a claim for $341,559.50 for legal costs incurred. My truckers prayer for today: Oh merciful father, thank you for guiding me here to this place in Richmond Hill, Ontario through this long, dark, and rainy night. Grant me a safe return to my Loved ones during the coming night. And Lird, if it isn’t too much to ask, U beseach thee to deny entrance into your heavenly realm the architect that designed this hell hole I just spent 15 minutes trying to back into a door at. Amen. Man I hate the way these phones play games. I know what I wrote.